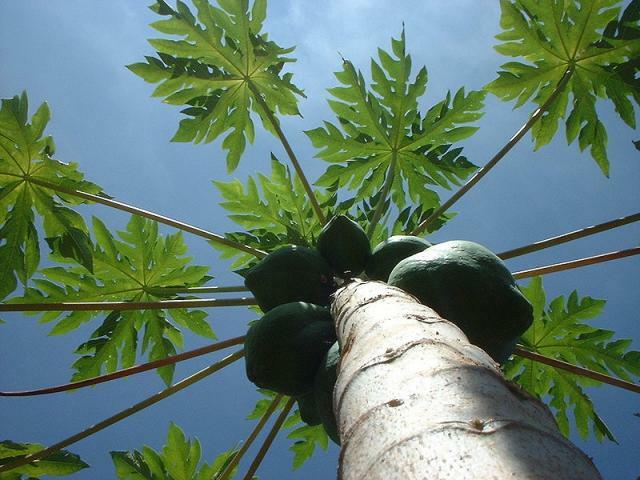 The papaya tree (Carica papaya L.) is a fast growing perennial branchless tree up to 10 m high, with a crown of very large palmate leaves, at the base of which the fruits are clustered. It is mainly cultivated for its edible fruits which appear 10 months after planting. They are pyriform, orange or red-orange when ripe and may weigh up to 9 kg each. Fruits are tasty, sweet and juicy. 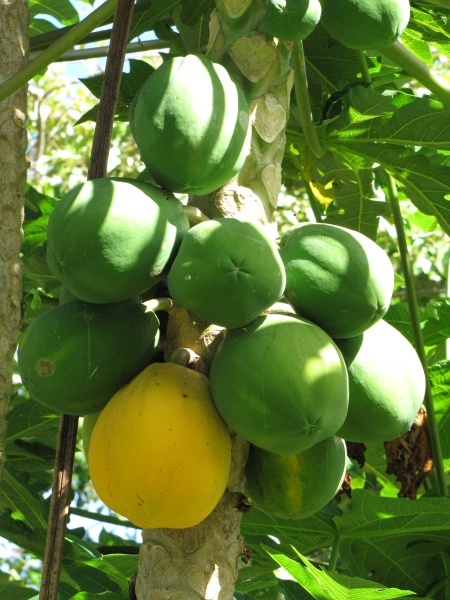 Papaya fruits are a palatable feedstuff and the leaves and fruit by-products are also used to feed animals (Ecoport, 2009; Ecocrop, 2009). Papaya is thought to have originated from Mexico and Central America. It was spread during the 16th century, by Spanish explorers, from Central America to the Caribbean and South-East Asia. It is now widespread in the tropics (between 32°N and S) in South America, Africa and Asia, and in the warm subtropics (Oceania). Optimal growth conditions are temperatures between 21 and 33°C, from sea level to an altitude of 1600 m, with 1200 mm annual rainfall. It requires light well-drained soils, rich in organic matter (soil pH of 6.0-6.5) (Villegas, 1991). Warm and sunny seasons enhance fruit quality. Shade is important as well as windbreaks. 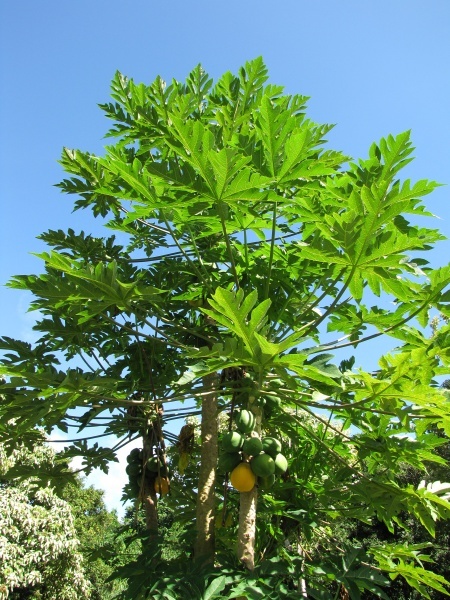 Papaya is sensitive to salinity and frost, and does not tolerate waterlogging and flooding (Ecoport, 2009). Papaya cultivation requires heavy fertilizer applications because nutrient removal is reported to be 1 kg N, 0.2 kg P and 2.5 kg K/t fruit. Use of manure and mulch steadies the release of nutrients (Villegas, 1991). Papaya fruit (when unripe), as well as bark, leaves and seeds, contain a proteolytic enzyme, papain, that degrades proteins into amino-acids and is used to tenderize meat. Papaya pomace is the by-product containing peels and seeds obtained after extraction of juice from the fruit. It is a potential alternative feedstuff since it has a high protein content (Naveen et al., 2007). Dry matter and protein digestibility in buffaloes are up to 49.9% and 51.4% respectively (Ramesh Babu et al., 2003). Papaya juice by-products were found to have a higher energy value than maize silage and could partly replace energy concentrates in diets for growing cattle (Azevêdo et al., 2011). 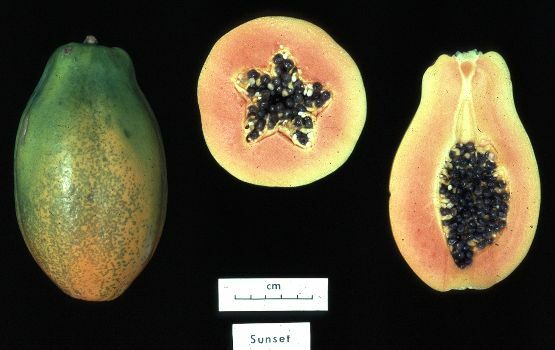 Papaya fruits supplemented with concentrates have been fed to pigs with good results (Henke, 1949; Göhl, 1982). 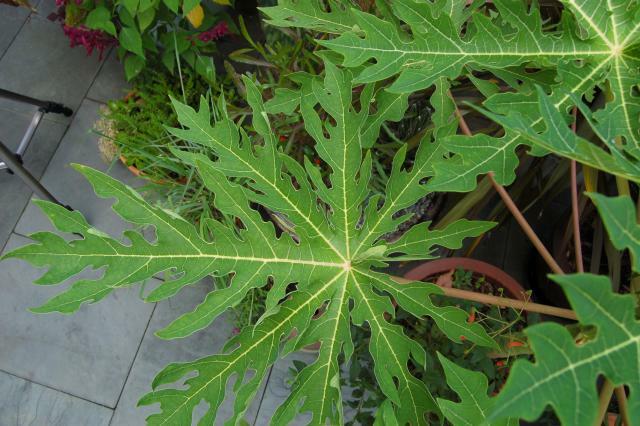 Papaya leaves given to crossbred weaned rabbits had a better feeding value than Guinea grass (Megathyrsus maximus) and Tridax procumbens (Taiwo et al., 2005). Papaya leaf meal included at 13 to 18% in the diet of Asian sea bass gave lower growth than the control diet (Eusebio et al., 2000). Indian prawns (Fenneropenaeus indicus, formerly Penaeus indicus), fed a soybean meal-based diet with papaya leaf meal replacing 9% of the protein, had a non-significantly lower weight gain, growth rate and survival rate than those fed the control diet (Eusebio et al., 1998). Papaya fruits can be used as a cheap source of feed to Archachatina marginata though they give lower performances than bananas. Ripe fruits are preferable to unripe ones (Agbogidi et al., 2008). Papaya peels and leaves fed to giant West African snails gave the best results in feed intake, weight gain and shell increment with no adverse effects when compared to other tropical fruit by-products (mango, plantain and cocoyam) (Omole et al., 2004).